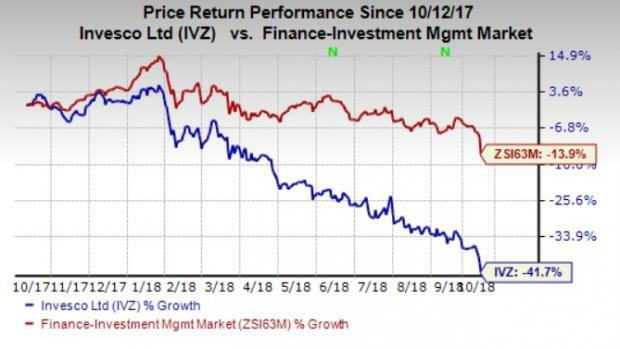 Shares of Invesco Ltd. IVZ declined 3%, following the release of its assets under management (AUM) as of Sep 30, 2018. The company’s preliminary month-end AUM of $980.9 billion decreased nearly 1% from the previous month. Unfavorable market returns, net long-term outflows and decrease in money market AUM were primary reasons behind the decline in total AUM. Moreover, foreign exchange dragged down the month’s AUM by $0.3 billion. However, these were partially offset by non-management fee earning AUM inflows as well as reinvested distributions. Invesco’s preliminary average total AUM for the quarter through Sep 30 was $985.1 billion, while preliminary average active AUM was $736.3 billion. At the end of the reported month, Invesco’s Equity AUM declined 0.7% from the previous month to $460.6 billion. Moreover, Balanced AUM of $57.0 billion declined 1% from the August 2018 level. Money Market AUM was $86.3 billion, down 2.7% from the prior month. Further, Fixed Income AUM decreased slightly from the August 2018 level to $234.3 billion. However, Alternatives AUM increased marginally from the last month to $142.7 billion. Invesco has been witnessing continued growth in AUM for the past few years, with the trend continuing in the first half of 2018. While this is expected to drive the top line, an overall challenging operating environment seems to be dampening investors’ sentiment at present. In the past year, shares of the company have lost 41.7% compared with 13.9% decline recorded by the industry. Invesco currently has a Zacks Rank #4 (Sell). Franklin Resources BEN announced preliminary AUM by its subsidiaries of $717.1 billion for September. Results display marginal fall from $722.4 billion recorded as of Aug 31, 2018. Net market losses and net outflows were undermining factors. Cohen & Steers CNS reported preliminary AUM of $60.1 billion as of Sep 30, 2018, down 2% from the prior-month level. Market depreciation of $806 million, net outflows of $75 million and distributions of $333 million were the reasons behind the decline. T. Rowe Price Group, Inc. TROW announced preliminary AUM of $1.08 trillion for September 2018. Results reflect marginal fall from $1.09 trillion recorded on Aug 31, 2018.